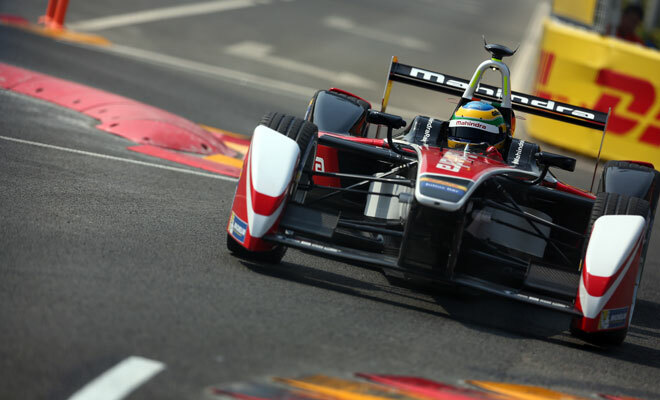 Last weekend saw the inaugural race in the first Formula E electric racing championship, staged in China on the streets of Beijing. The single-seater cars are intended to resemble Formula 1 racers, but the similarity is only skin deep. Most notably, Formula E cars don’t feature a screaming internal combustion engine but are powered by a 300kg, 30kWh lithium-ion battery. That’s not much more than the 24kWh reserves of a fully-charged Nissan Leaf. Unlike a Nissan Leaf, Formula E cars can accelerate from zero to 62mph in just three seconds. And they can keep racing at speeds of up to 155mph for half an hour at a time. And unlike in F1, each driver has the chance to use two cars in every race, swapping over half way between the startline and chequered flag to avoid an otherwise lengthy pit-stop for recharging. Beneath their different liveries, all 20 cars on the grid are essentially identical, differing only in race setup. 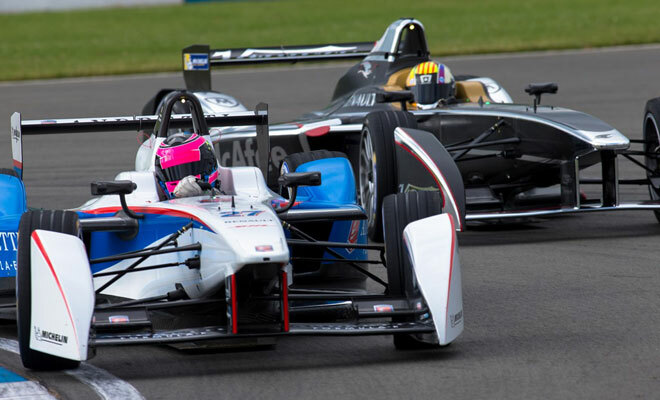 Next year, for the second Formula E championship due to start in late 2015, there will be more diversity with every team allowed to design and build their own car. This season’s machine, called the Spark-Renault SRT 01E, is a collaborative effort from a group of different companies. Renault designed the electric powertrain, Dallara the carbon-fibre chassis, McLaren provided the electric motor and drive electronics, and Hewland built the paddleshift five-speed gearbox; Williams built the batteries, Michelin contributed tyres, and finally Spark Racing Technology assembled all 40 cars, plus two spares, and took care of aerodynamics and suspension design. More spare cars may well be needed as the first race ended in dramatic style, with a last-corner collision taking out the two front running cars of Nicolas Prost and Nick Heidfeld, handing victory to Lucas di Grassi. With 20 top drivers in virtually identical machines, it came as no surprise to see such a white-knuckle result. Given the fledgling nature of the championship, there’s a big pause before race 2, which will be staged on 22 November in Malaysia. After that, the timetable becomes roughly one race a month until the final round in London, on 27 June 2015. The London race will be held in Battersea Park, and indeed all the races on the calendar will be staged using temporary city circuits, rather than purpose-built racetracks familiar from other championships. Obtaining approval from the various local governments has been eased by the relatively quiet running of Formula E cars – they are by no means silent, but the scream of their gears and motors is positively peaceful compared to the explosive racket produced by an F1 car. Bringing racing closer to the hearts of cities is part of the plan for Formula E, to try to make more people aware of the potential of electric propulsion. 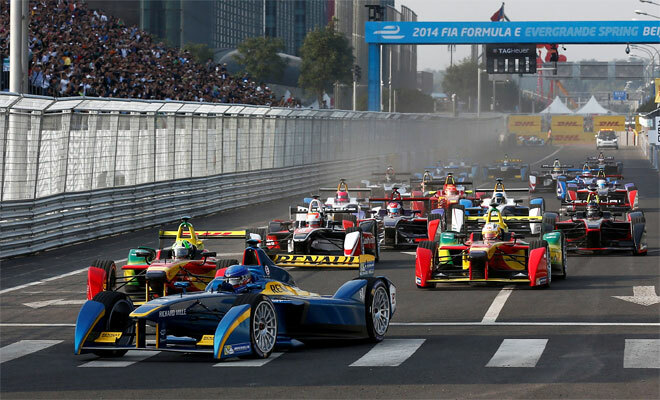 “There are a lot more sports fans than environmentalists,” Formula E founder and chief executive Alejandro Agag has noted, arguing that racing will encourage an unprecedented number of people to take an interest in electric cars. Staged every other year in Australia, the World Solar Challenge follows a 3,000km route from Darwin on the north coast down through the outback to Adelaide in the south. Teams compete in slender, lightweight electric cars powered solely by on-board solar panels, with a 5kWh battery as energy buffer. Top speeds won’t trouble a Formula E car, but they might attract the attention of the highway patrol. 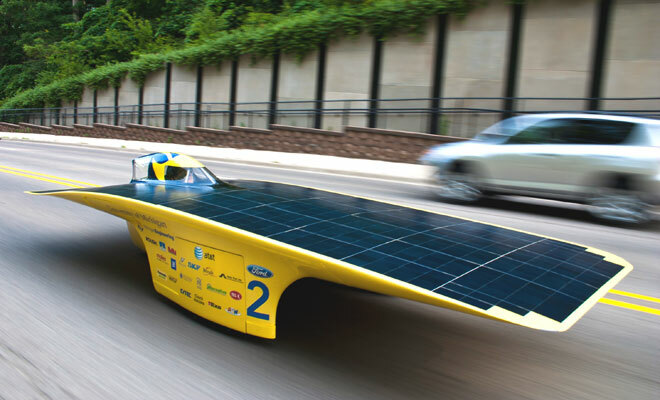 Indeed in 2007 the organisers reduced the maximum allowed area of solar panels by 25% to try to keep cruising speeds in check. This, plus the tendency of competitors to drive on the side of the road with the most favourable camber for catching the sun, rather than the side actually laid down by law, makes the challenge more exciting than it might appear. The event is held on open public roads, meaning the cars might look outlandish but have to be road legal and appropriately insured. I’ve scoured the site of Australian car insurance specialist HBF and couldn’t find a quote for a solar racer, though it will happily insure a Tesla Model S. That should have no trouble keeping up, providing you can find a dozen places to recharge along the route. Last year’s winner completed the course at an average speed of 56mph. The next challenge race is due to take place between 18 and 25 October 2015. 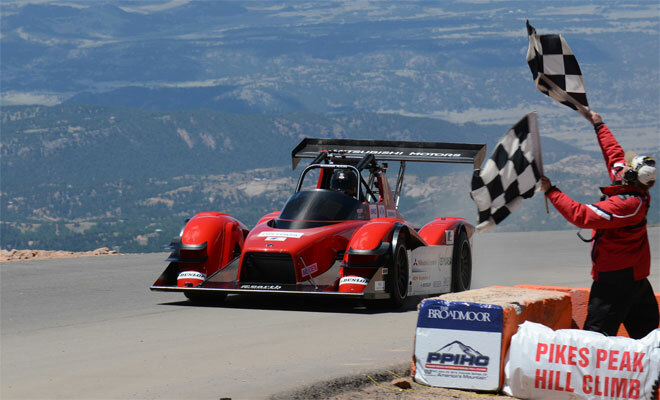 Calling it a hill climb is something of an understatement for Pikes Peak. Forget the gently rising ribbon of tarmac at Goodwood, this is a 20km course up the side of a mountain, starting at 2,862 metres altitude and running all the way to the 4,301-metre summit. A total of 156 corners and sometimes dramatic changes in atmospheric conditions means you might need something stiffer than a Pimms when you arrive at the top. The first race up the mountain took place in 1916, but electric cars joined the competition only in 2012. There are currently two electric classes – one for lightly modified production EVs and another for cutting-edge race cars. A pair of Mitsubishi MiEV Evolution III cars in the latter category finished in second and third place overall in the 2014 event, held in June to avoid the snow. The faster of the pair was just 2.5 seconds off the winner’s pace. I don’t imagine that a Pikes Peak MiEV has much in common with the egg-shaped i-MiEV electric car you can actually buy. The racer features a motor for each wheel, with a combined output of 450kW (603bhp), supplied by a 50kWh battery. The production i-MiEV, by contrast, has a 47kW (63bhp) motor and 16kWh battery.